Molebox VS can pass some arguments to your packed program. It's usually used in game launchers to tell game executable where the server is located. My unpacker will now show you the command-line you need to use to run unpacked EXE file correctly. Updated download link! 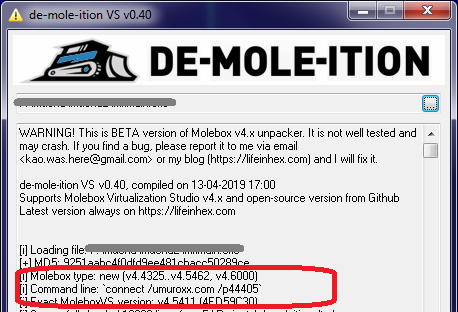 Fixes issue with "[x] EXCEPTION EOutOfMemory" that happened when very large files were packed with very old Molebox VS. Bug was reported by MMM, thank you! [x] Expected section name ".enigma2", found ".ultra"
Can you help me to see the game links below? None of the three software can unpackage the game.Please take a look at it for me.I'm sorry that I don't understand English. It's all machine translation. My unpacker cannot unpack your file right now but I will fix it this week. The problem has been solved. Thank you. [i] Succesfully loaded 22 lines from C:\Users\Administrator\Desktop\mole_dictionary.txt. [!] WARNING: fixing relocations failed! File will probably not run! [i] All relocations fixed successfully!